There’s a new IDEA in town! This IDEA isn’t the IDEA you’re used to! But let’s keep the great IDEAs coming!! In December, Congress passed the 21st Century Integrated Digital Experience Act (IDEA), which is designed to make federal websites more accessible, user friendly, and secure. This new law places stronger importance on the existing accessibility standards of Rehabilitation Act Section 508. It requires federal agencies to modernize their websites and digital services. 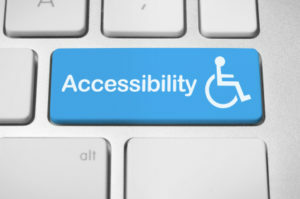 There are eight specific criteria including accessibility for people with disabilities. Within 180 days of the law’s passage, all new and redesigned federal websites must comply with the new criteria, and agencies must submit plans to Congress for how they will accelerate the use of electronic signatures. IDEA also requires federal chief information officers (CIOs) to coordinate with other executives and ensure that departments plan adequate funding and resources to execute these requirements, including accessibility features. Signed into law by the President on December 20, 2018, the provisions include several significant requirements to make federal websites more user friendly, usable, and robust for all users, including a requirement that digital formats of all paper-based forms be available within two years. For more information, visit the Partnership on Employment and Accessible Technology at IDEA.